Mimosa Leisure Estate captured the imagination of Asian Tourists in the 80s and 90s before government took over its management. New life emerges recently with investments from HK-based Yats Leisure opening fine dining restaurant, wine bar and a charming London Pub. Mimosa Leisure Estate was the darling of not only Filipino tourist and casinos players but also tourists from all over Asia and major cities around the world. Its 36-hole golf course benefited from the appearance of Tiger Woods and its casinos lit up by dancers brought in from Russia. For over a decade, this jewel has become tarnished and rusty, losing almost all the attention that its previous owners managed to garner from well-heeled gamblers and pleasure seekers from all over Asia heading to Clark Airbase Philippines. New life began to surface with new investors coming into play. Among them is Hong Kong-based Yats International, a developer and operator of properties in the hospitality and residential sectors. One of the first things that Yats International put up was the fine-dining Yats Restaurant, a world-class restaurant now managed by English chef Philip Golding assisted by Dutch Restaurant Manager Bastiaan Van de Walle. This restaurant serves up world-class Mediterranean cuisine with ingredients flown in frequently via Clark Freeport's International Airport DMIA. Prices are extremely reasonable for this level of culinary excellence. The wine craze is not absent in Mimosa. Yats Wine Cellars quickly stocked up 20,000 bottles of vintage wines in its 24hr temperature controlled walk-in cellars at Yats Restuarant. This helps the restaurant bolster its 3000-line wine list, one that is unheard of even by today's standards internationally. 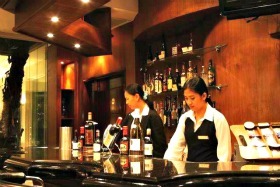 Regular public wine tasting events are held at the Clark Wine Center located along the main highway MA Roxas. Called the Yats Wine Experience, these ticketed events cost around p1,000 to attend which is good value because of the high quality of wine served. It is also a rich learning experience for wine enthusiasts at Clark Airbase Philippines. The Magnum Room Wine bar was soon to appear to serve as a meeting place for local and foreign executives needing a place to relax after dinner, smoke a Cuban Cigar over a glass of Vintage Port, Armagnac, Cognac or Single Malt. Luxury is once again back in this once illustrious estate. The latest project to appear was the London Pub, a partnership between Yats and some individuals who are equally bullish in Mimosa's imminent comeback. Opened in January 2009, the London Pub became an immediate success as tourists and local business executives spontaneously gather for a congenial evening of wine, beer, good food and of course, excellent company. Yats International did not stop with Mimosa Leisure Estate. While all that was going on, it acquired some 18 hectares of land in prime locations in Clark Freeport and used some of it to build the idyllic Clearwater Resort & Country Club. With Mimosa Leisure Estate poised to be sold to a private company, all signs point to a quick revival of its splendor. A visit is certainly worth it for Asian and local tourists. How to get to this fine-dining restaurant in Clark Airbase Philippines? Once in Clark Freeport, go straight until hitting Mimosa. Enter Mimosa, stay on the left on Mimosa Drive, go past the Holiday Inn and Yats Restaurant (green top, independent 1-storey structure) is on the left. Just past the Yats Restaurant is the London Pub.